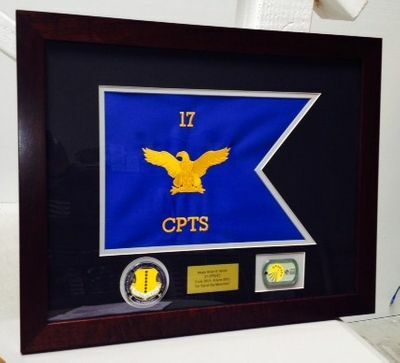 Framed Guidons are a great farewell gift or momento. We can make something for you that will leave a memorable impression for that special person. We make our own frames and cut our own matting so we can produce a nice color coordinated gift for you. We use only the finest materials and our goal is to provide a most impressive gift for that special occasion and recipient. We will not compromise on quality. Our standard framed guidon kits feature solid wood frames, Acrylic glass to prevent breakage, single layer, acid free matting, foam core backing and mounting hardware installed. Wood finished available are Oak, Walnut, or Cherry. We can provide additional customization and only charge 6.00 per cutting.